This slab of cream and brown magnificence is a MAN A95 double decker bus, resplendent in Hong Kong’s KMB livery, and it’s been built by Hong Kong resident and previous bloggee ShineYu. With eight Power Functions motors hidden inside the huge body, ShineYu’s incredible A95 double decker bus not only looks superb but it functions wonderfully too. Two XL motors drive the MAN, whilst two Servos turn the two steering axles. A further four Medium motors power the automatic doors, all of which are controlled remotely. There’s lots more to see of this seriously impressive build at the Eurobricks discussion forum, and you can see ShineYu’s KMB MAN A95 in action via the video below. Well, it is if you’re reading this in the Northern hemisphere. Plus we heard your Mom likes a good plough*, so today we’ve got one! Built by Damian Plesniak it’s quite a bit of kit too, and it’s absolutely packed with working functionality. Fully remote controlled, Damian’s MAN truck includes working drive (via an XL Motor), steering (via a Servo), plough* blade raising/lowering, blade rotation and gritter rotation (powered by a Medium Motor each), plus a tilting cabin, opening doors, a working V6 engine and LED lights. There’s lots more to see at both Flickr and Eurobricks, where you can also find a video showing all of the functions in action. No America, it isn’t ‘plow’. …whatta man, whatta man, whatta man, what a mighty good man. Sorry about that. Anyhoo, this is a mighty good MAN, built by Beat Felber of Flickr, and featuring remotely controlled 8×6 drive, steering on the first and second axles, motorised trailer coupling, working headlights and warning beacons, opening doors and hood, and a pneumatically tilting cab. 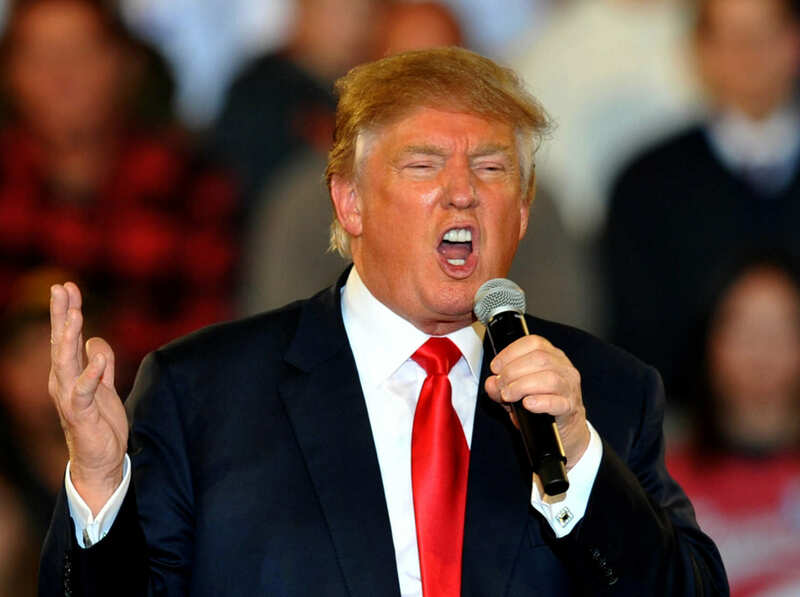 It’s a spectacular creation, and it looks absolutely stunning on the outside too (and orange isn’t an easy thing to pull off if you’re a man). There’s lots more of this incredible creation to see at Beat’s photostream – click the link above to make the jump to the full gallery and technical details. This mighty remote control MAN TGS Dakar Rally truck was found on Eurobricks today. It’s the work of Teo and it features twin Buggy Motor drive, Servo steering, live axle suspension front and rear, and working lights. Teo’s truck also looks the part with some beautifully accurate custom stickerage. There’s lots more to see at the Eurobricks forum – click here to take part. 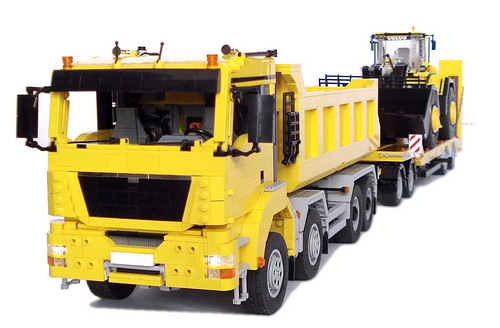 These excellent Town-scale trucks were suggested to us by a reader. They come from Flickr’s Smigol, and they are wonderfully realistic. Above are a pair of MAN TGS Dakar race trucks, whilst below another MAN is joined by a Volvo FH, this time in logging specification. There’s more to see of all the details, including several posable working features, at the link above. It sounds like a disgusting drink you’re likely to find in a dodgy bar in Magaluf, but it’s also this lovely Town style tow truck by previous bloggee Marin Stipkovic. 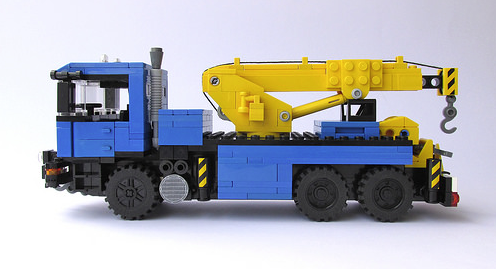 You can see more of his excellent three-axle MAN truck with towing boom on Flickr. We continue our run of Town vehicles here at TLCB with two more mini-figure delights. 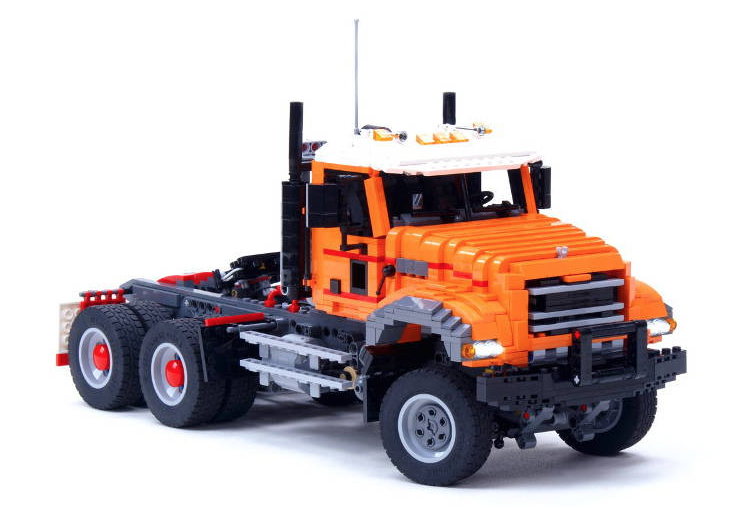 Suggested to us by a reader, Brickshelf’s keko007 has built a pair of superb construction vehicles. 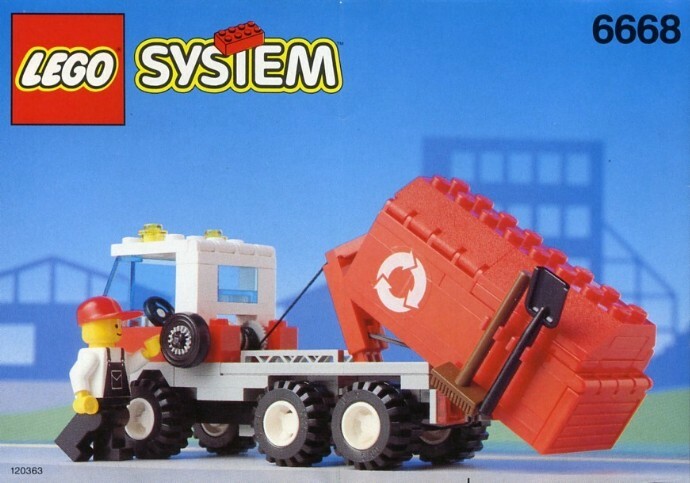 Both his MAN cement truck and Volvo L60 front loader feature a few working functions too, making them nicely playable creations. You can see more of these and keko’s other models via the link above. 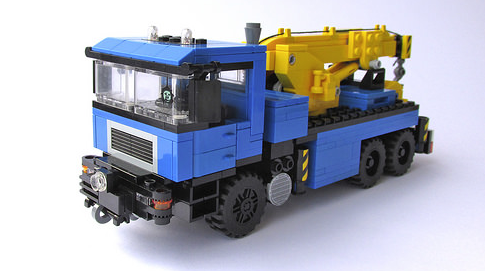 This beautiful MAN 8×4 tow truck is the work of Flickr and Brickshelf‘s Marek Markiewicz (aka M-Longer), and it’s one of the finest looking Model Team trucks of the year. But its beauty is much more than skin deep. Within the wonderfully replicated bodywork sits one of the most advanced Technic systems we’ve seen to date. Thirteen separate functions are generated by a variety of Power Functions motors and Technic pneumatics, which are all remotely controlled through LEGO’s infrared receivers. These include drive, steering, working stabilisers, raising and extending the boom and under-lift, four separate winches, plus an electrically driven pneumatic compressor with auto shut-off. The only way to do this incredible engineering feat justice is through a video, and fortunately Mr. Markiewicz has created just that. Watch below, be amazed. The steady stream of Elves returning to TLCB office with a great build originating from Poland and/or the LUGPol group indicates that something special must be happening over there. Marek Markiewicz (aka M_Longer) is one such builder, and his latest work typifies the excellent creations produced by LUGPol’s users. It’s a fully Power Functions remote controlled MAN tipper truck (pictured here with his L580 front loader), and the engineering inside is impeccable. See what Marek’s MAN can do in the video below! Our second creation comes from one of Poland’s most famous builders – and one of the most frequently blogged – the incredible Sariel. His latest work is probably the most capable remote control Lego vehicle we’ve ever seen. See how unstoppable his Ripsaw XL is via the brilliant video – complete with a killer Death in Vegas soundtrack – below. Special thanks go to LUGPol for continuing to supply our Elves with so many high quality creations. We know many LUGPol members visit TLCB, so if you’re one of them and would like us to feature LUGPol as a Group of the Month* let us know how we can find out a bit more about you! *Or Several Months. We’re quite unreliable with this feature!